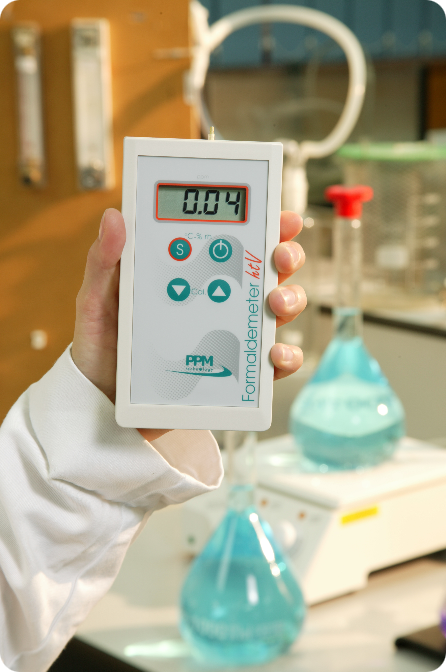 The latest 3-parameter instrument from PPM Technology directly measures airborne formaldehyde concentrations as well as ambient temperature and humidity levels. Building on the technology developed in the popular Formaldemeter 400, with the addition of unique compensation techniques, the htV can now accurately measure low levels of formaldehyde — even in humid conditions — while still maintaining ease of use and simple calibration. With further importance being put on air quality in public buildings, the workplace and in homes, the htV is aimed towards being the most accurate monitor while still providing quick and simple operation from a hand-held device. Displays formaldehyde concentration in both parts per million (ppm) and mg/m³. Immune to extremes of humidity and temperature thanks to a unique sampling method. 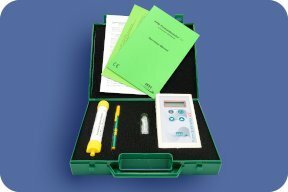 Simple calibration procedure can be carried out in a few minutes after only minimal training – the full kit contains a field calibration standard (6 months shelf-life) and a comprehensive operation manual. Fast sampling by pressing a single button and quick recovery from normal concentrations. Full range of accessories available including rear stand or wall mount for hands-free operation and PC remote control software for data logging. See separate brochure for more details. Service centres throughout the world and full technical support provided under a comprehensive manufacturers warranty. Bespoke solutions available for your specific application – contact our technical department. Precision 94% of all instrument readings meet the NIOSH criteria for an acceptable method when measuring 0.3ppm of formaldehyde over a relative humidity range of 25-70%. The NIOSH criterion for acceptability is that all results fall within ±25% of the true value at the 95% confidence level. Calibration Standard: PPM supplies an easy-to-use formaldehyde calibration standard tube for checking and adjusting the calibration of the Formaldemeter htV. The tube produces a known concentration of formaldehyde vapour that can be sampled by the instrument to check accuracy and performance. The standard has a 100-sample capacity or a useful life of six months (whichever occurs sooner). PPM AMS-2 Aldehyde Monitoring Station: The PPM AMS-2 enables the Formaldemeter htV to be used as a data logging semi-continuous formaldehyde area monitor. The AMS-2 is a compact bench top unit that connects to the hand held instrument and essentially automates the operation of the Formaldemeter htV. SPC-1 System: The Single Point Control System enables formaldehyde monitoring to be carried out at one or more location simultaneously. Several monitoring points can be connected to the system and monitored at a central location via one PC. Desk Stands and Wall Brackets: When the hand-held is used in continuous or automated modes with the AMS-2, SPC-1 or i/fB then a range of special brackets are available so that the htV can be placed in the ideal position to achieve the best results. By mounting the htV on a wall then samples can be taken at head-height - the area of air that is being breathed by the occupants.